The Selva Maya (Jungle of the Maya) is one of the world's most magical yet least appreciated places—an enormous tropical forest that encompasses much of Belize, Guatemala, and Mexico's Yucatan Peninsula. At 9,000,000 acres, it is the largest contiguous tropical forest north of the Amazon in the Western Hemisphere. Within its borders, the Selva Maya provides habitat for an astonishing diversity of plants and animals—more than 500 species of birds alone. The forest also contains the fascinating ruins of ancient Maya cities, which attract visitors and researchers from all over the globe. Jungle of the Maya presents a stunning photographic portrait of this irreplaceable natural treasure. 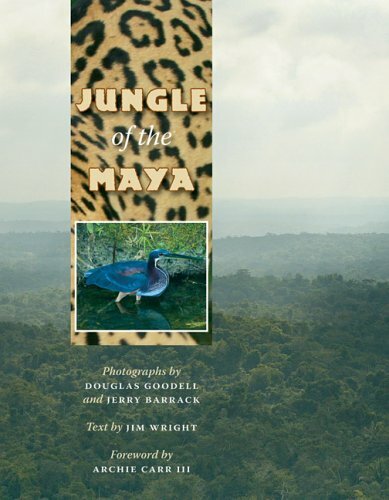 Nature photographers Douglas Goodell and Jerry Barrack capture the living wonders of the jungle—jaguars and other cats; spider and howler monkeys; hummingbirds and butterflies; and snakes, amphibians, and insects—as well as the region's hallmark Maya sites, including Tikal, Chichen Itza, Uxmal, and Tulum. Environmental writer Jim Wright invitingly describes the Selva Maya's natural and human history, helping visitors and residents appreciate the riches to be found in the forest and the need to protect and preserve them for generations to come.